TASTE: Cloves. A lot of other flavors I like that I cannot identify. Anyhow, 2012 was a better ale than it is now. But, 2016 probably will be even better in a year. A spice beer that is just a tad understated. They also have the carbonation a touch brisk which enhances the bitter and gives the spice an odd aspect. The spices are still definitely there, but the brisk carbonation, bitterness, and slight dryness of beer are qualities not usually associated with spice beers. Still not bad. 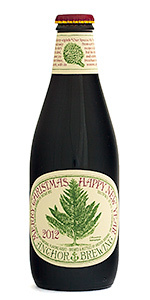 One of the worst Christmas beers out there.